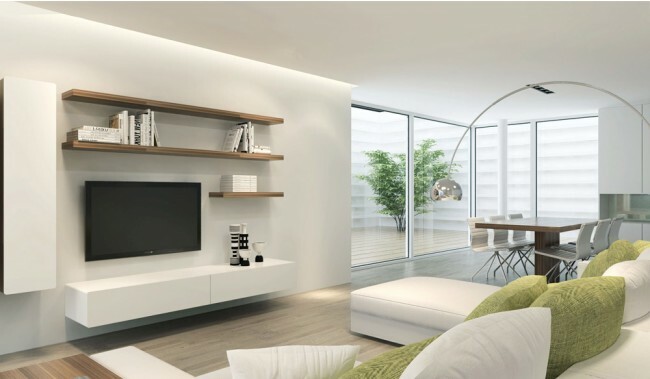 The simple yet stylish Ikon Floating Entertainment Unit comes in a contemporary white high gloss finish, making it an ideal choice for any modern home.This entertainment unit features an off the floor design that creates a floating effect, helping to generate the illusion of extra space. The floating tv unit is wall mounted. An aluminium track is firstly installed to the wall and the cabinet is then hung and affixed to the track using the 4 pre-installed brackets within the cabinet. Those brackets are fully adjustable and pull the unit to the wall and allow levelling also. Reinforced top to hold even the heaviest TV. Soft close drawers and doors, and concealed drawer runners. Easy cable management system & closable doors, perfect for holding most modern equipment and gaming consoles neatly. Available in white high gloss finish. Available in 2 size options. Recommended TV Size to sit above or on unit: Up to 47 - 50"" for 166cm model and up to 75" for 220cm model. NB: Product arrives fully assembled, customer is responsible for mounting on wall. Fantastic product slight delay on order but it was only due to the delivery company that Delux Deco uses. Worth waiting for it through.